Sydney (AFP) - The offices of Save the Children workers helping asylum-seekers on the Pacific island of Nauru have been raided by police, the aid agency said Tuesday, as debate rages in Australia over new whistleblower laws. Asylum-seekers attempting to enter Australia by boat are turned back or sent to detention camps on Nauru or Papua New Guinea under Canberra's tough immigration policy, and are blocked from resettling on the mainland even if found to be refugees. Human rights and refugee advocacy groups have criticised the policy and the conditions in the camps, with some Save the Children staff previously alleging that asylum-seekers at the tiny Pacific outpost were subject to abuse. It is understood that police seized electronic items such as phones and laptops during the raid on Saturday, with the operation believed to be related to stories leaked to media in Australia. Nauru police could not be reached for comment and an Australian immigration department spokesman said its officials were not involved in the operation. Save the Children Australia said the British-founded charity had "no reason to believe that our staff have acted inappropriately, but we are of course assisting the Nauru Police Force with its inquiries". "As always, our priority remains working to mitigate the harmful impacts of offshore immigration detention, to the extent that the circumstances allow." The raid came as thousands of Australians rallied over the weekend calling for the camps to be closed, and as doctors at a Melbourne hospital said children they treated from immigration centres should not be returned to detention where conditions could harm them. 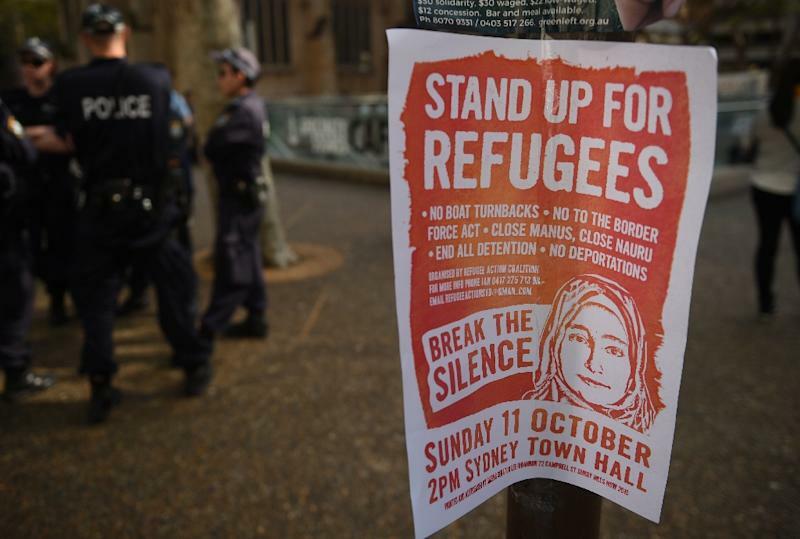 Medical professionals also raised concerns at the rallies that a new Australian whistleblower law could block their colleagues working at the camps from speaking out if they suspected asylum-seekers were being abused. The legislation led to UN Special Rapporteur on the human rights of migrants Francois Crepeau postponing a visit to Australia last month in part due to fears that people who spoke to him could face legal reprisals. Australia has said its hardline immigration policy is necessary to stop asylum-seekers from dying at sea. Some 1,589 asylum-seekers -- 1,382 men, 114 women and 93 children -- are held on Manus Island and Nauru, according to immigration figures ending August 31.